(CNS): The president of the Cayman Islands Chamber of Commerce is beseeching the community to come forward and give information about violent crime through the anonymity of the crime-stoppers hotline if they are afraid to go directly to the police. Stuart Bostock said in light of the recent tragedy in which four year old Jeremiah Barnes was shot dead by a gun man at West Bay gas station the community had to come forward and they could use 800 TIPS (8477) to give any information they have regarding this or any other crime. In a recent Crime & CCTV Presentation organised by the Chamber of Commerce as part of the Be Informed series, the Commissioner of Police, David Baines raised the problem of the community’s reluctance to come forward with information that could be vital to investigations and arrests. Bostock said that the RCIPS support the Cayman Crime Stoppers programme and encourage members of the public to use the confidential system in order to put their mind at rest when fearful of reprisals. “A failure of the public to bring forth information will surely bring failure to the RCIPS as they endeavour to keep crime under control and consequently failure for our society as a whole,” Crime Stoppers Chairman, Eric Bush added. Cayman Crime Stoppers was formed in 1993 by the Cayman Islands Chamber of Commerce to provide a vital service, which helps protect the community from crime. Working in close partnership with the Royal Cayman Islands Police Service, the community and the media, it has become one of the most effective crime solving tools available to local law enforcement agencies. Cayman Crime Stoppers provides a safe and secure means for anybody with information about a crime to share it freely whilst protecting their identity. It could also earn them a reward of up to $1,000. 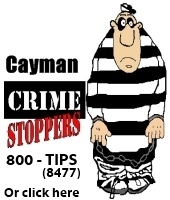 Cayman Crime Stoppers is one of some 1200 Crime Stoppers programmes in 20 countries. Since its inception in the United States in 1976, Crime Stoppers has been responsible for over 700,000 arrests, over a million cleared cases, the recovery of nearly two billion dollars of property and drug seizures worth a staggering seven billion dollars. About 83 million dollars have been paid in rewards through Crime Stoppers Programmes across the globe. Cayman Crime Stoppers is a non-profit civilian run organisation and is also a recognized regional member of Crime Stoppers International. The board is community based consisting of civilian leaders within the Cayman Islands and one law enforcement coordinator who assists with the dissemination of information received by the Cayman Crime Stoppers anonymous call-center operated in Miami, Florida. If you have any information about a crime, call Cayman Crime Stoppers at 800-8477, that one call could save a life. "Cayman Crime Stoppers was formed in 1993 by the Cayman Islands Chamber of Commerce to provide a vital service, which helps protect the community from crime. Working in close partnership with the Royal Cayman Islands Police Service, the community and the media, it has become one of the most effective crime solving tools available to local law enforcement agencies. Cayman Crime Stoppers provides a safe and secure means for anybody with information about a crime to share it freely whilst protecting their identity. It could also earn them a reward of up to $1,000." if it’s totally anonymous and no-one takes your details down, how do you get your reward? there is some conflicting information here. I assume (possibly incorrectly) that you can choose to leave your details with the operator, that way if a reward is payable it can be provided? otherwise what is the point of offering an award for information given? it’s a shame that there is a service that no one wants to use. i think the issueis that trust has broken down between some (ok, alot) of the community and the police. at the end of the day, people won’t give evidence or testify if they feel that they will then be endangered. I understand from good sources it works like this: The phones are answered in MIAMI as a part of their Crimestoppers system there. The Tipster is given a NUMBER and the details of the crime is taken by the operator in Miami- nothing else. The operator relays the information to Cayman Police. Should a tip lead to an arrest and conviction, then the person with the number can call back to claim money or choose not to if they want. Each tip has a unique number so it can be verified by Crimestoppers when the person calls back. Both statements in press release are therefore correct and we need to use Crimestoppers more often, even if the reward is not your motivation. My question is: After we give in some "vital" information that leads to the apprehension of criminals, what happens then? When they go to court, who then gives that "testimony"? The anoynmous caller? Let me say this, I will not nor have I ever had enough confidence in our RCIPS to offer my testimony/ life in order to get ONE criminal off our roads, and still be faced with prospect of retaliation of his people or gang. THis is USELESS, last time I checked it was a police officer who gave up the location of a person who was in wittness protection, which led to the witness being shot multiple times. That will not be my FATE or any of my loved ones. Since Cayman CrimeStoppers was created in 1993, there have been thousands of calls received on the 800-8477 number. These calls have lead to numerous arrests and convictions as well as the recovery of millions of dollars in illegal drugs, firearms and stolen property. During this time, not one caller has been compromised. When you call 800-8477, the call is answered in Miami where the operator is only interested in the information you have about crime. They never ask your name or any questions that seek to identify you. The information is then sent to the Law Enforcement Coordinator, who is a Police Officer, and they send the information to the relevant department or unit for action and/or investigation. It is the responsibility the Police to use that information and to build a case. You have done your part by giving your information. Information can also be about where illegal guns and drugs are being stored or where stolen property is kept. The more information we (as a community) give the police, the better they can be at arresting and convicting criminals and ultimately keeping us safe. I ask you to reconsider your stance and if you do have information about crime, please call CrimeStoppers at 800-8477 or use our website http://www.crimestoppers.ky/. Eric you have not answered the writers question as to what happens if the information from a caller does lead to an arrest. Will that person need to be called as a witness and how will that work if it is anonyomous. Trust me I understand your frustrations with people not calling in but they are just not feeling secure right now. Maybe Crime Stoppers could have a short segment on CITN showing an operater taking a call in Miami and how there is no caller ID shown to ease some peoples minds that it is in fact untraceable. If you tell them where the weapons are and they find the weapons, why would you need to testify? They have their evidence. Also, one suggestion for government which I think was talked about before. Make an agreement with other Caribbean countries OR uk in regards to a witness protection program. UK would probably be best because there are so many places to go. I wouldn’t recommend Jamaica because too many people know each other. The penalty for any one releasing information given to the RCIPS should be brought to justice by being imprisioned . With experiences that I have had in Cayman I personally would have to rethink brfore I would give any evidence about anyone. "These calls have lead to numerous arrests and convictions as well as the recovery of millions of dollars in illegal drugs, firearms and stolen property." This is exactly the same line that was being trotted out when I was the Crime Reporter at Net News but I have yet to see one example cited of CrimeStoppers actually assisting in the solving of a major crime. I’m not knocking CrimeStoppers, it’s tried and tested in the UK with very good results, but you need to put some meat in the argument and give folks some tangible evidence. I’m convinced that there are people participating in this forum that know somthing about the killer or his whereabouts, but you are scared. Well I have news for you, You’re going to not only be scared but out of your mind when its your turn to mourn for your own child should somthing happen in your own family! Your child does not deserve to live anymore than this four year old that was shot dead in cold blood. God does not lie, you’re on here and I know it and Gods knows you have been on this forum!. So do the right thing, and make that call. "…I will not nor have I ever had enough confidence in our RCIPS to offer my testimony/ life in order to get ONE criminal off our roads"
Then don’t ever complain about crime in these islands, and when you become a victim, don’t expect anyone to help you. What are you going to do when your turn comes, when its your child or one close to you? You have NO EXCUSE, Crime stoppers is there for you to call, it works IN THE U.S. AND all overthe world, the phone for heaven sake answers in the U.S, isn’t that good enough for you? or are you going to be stupid enough to tell someone tattle tale friend of yours that you made the call? Don’t you trust God to bless you and protect your family for you doing the right thing? OR are you going to live with GUILT and the blood of this innocent four year old on your hands and on your CONSCIENCE? !